There has been a Nissan Pathfinder, in one form or another, since 1984, but the version we’re talking about here is the model from the mid-2000s, the one with the big, brash chrome grille. It’s none-more-American in its styling even if Nissan’s actual US pickup (the Titan) would absolutely dwarf it. Being based on the same mechanical package as the Navara pickup means it’s rugged and hard-working, but also a touch crude compared to some rivals. There was, honestly, a 4.0-litre V6 petrol version at one point, but if you ever see or find one of those, we reckon you’ll win all the car spotting points there are. 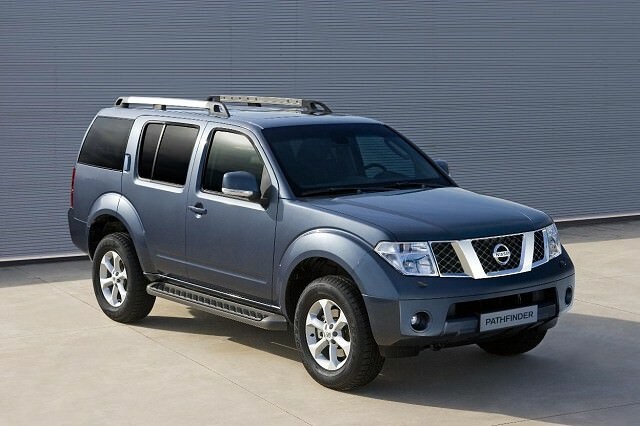 Unsurprisingly, 99.999999 per cent of all Pathfinders came with Nissan’s 2.5-litre four-cylinder diesel engine. It’s a seriously tough unit, and as long as you keep it serviced, there are unlikely to be any major mechanical maladies in your future. As all but the most basic Pathfinders came with seven seats, it’s also considerably cheaper to service than a rival Land Rover Discovery or Volvo XC90. Aside from a couple of recalls, one for propshafts and one for steering issues, the Pathfinder seems to be unbreakably reliable and solid. This means you need to check them really carefully at second hand buying time though, as many will have been used and abused and given hard working lives, something that might not be obvious from a cursory inspection. It’s crucial to get underneath and have a good poke around as these are proper off-roaders, which can mean that they’ve been damaged underneath as a result of drivers being too confident in their abilities. For a car with commercial truck origins though, the Pathfinder was well equipped and most came with climate control and lots of airbags (it has a notably good EuroNCAP score by truck-based standards) and many having leather and satnav. The only issue is that while it’s cheaper by far to buy and run than a Discovery or XC90, it’s far cruder – the ride is bouncy, the body roll in corners prodigious and the engine rather noisy. You’ll probably have to go pre-2008 to find a good one as they got expensive to tax after the switch to CO2-based motor tax, but around €9k gets you a really good one. It may not be the most sophisticated thing around, but the Pathfinder looks good, is affordable to buy and will go just about anywhere you ask it to. An old-fashioned, rough-riding 4x4 and for that we love it.